Stint or Stent – What’s the Difference? Home » Stint or Stent – What’s the Difference? The Midwest region of America is often mocked for its accent. English speakers from this region might pronounce some vowels differently than speakers in other parts of America. Linguists call this phenomenon the Northern Cities Vowel Shift. Minnesotans who say milk, for instance, might sound like they are asking for melk, in an archetypical example. The same vowel shift makes some words indistinguishable from others—stint and stent, for example, are separate words that fit into entirely separate contexts, but can sound the same when spoken by some Midwesterners. What’s the real difference between these words? Continue reading to learn more. What is the Difference Between Stint and Stent? 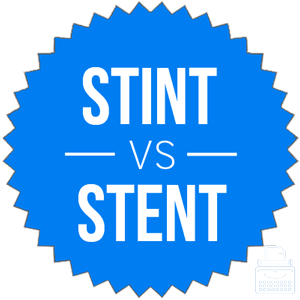 In this post, I will compare stint vs. stent. I will use each of these words in at least one example sentence, so you can see how they should appear in context. Plus, I will show you a helpful memory tool that you can use any time you need to choose either stent or stint. What does stint mean? The word stint is a noun. A stint is a short duration of time. It usually references a period of employment, but it can also be used in other contexts as well. The president of an organization may have served a stint in a lesser role before being promoted, or a criminal might serve a stint in jail after being convicted of a crime. During his stint as HR director, Mark cut retirement benefits for current employees and forced the union to accept lower wages until the next contract. I once served a stint as a fry cook at our downtown location before I applied for a supervisor position at our new franchise. What does stent mean? Stent is also a noun. A stent is a medical device—it can be a tube inserted into a blood vessel to open a blockage or a device inserted into a wound to promote healing. The surgeon removed the stent from Jules’s artery once she determined that he no longer needed it. Stents are useful medical devices that save many lives. Regional variations in vowel pronunciation might render the difference between stent and stint undetectable for some speakers. Still, stent should rhyme with rent and bent when spoken aloud; stint rhymes with hint and lint. Now, let’s go over a way to remember stent vs. stint. Both of these words are nouns, but they refer to very different concepts. A stint is a span of time. A stent is a medical apparatus. Since the words stent and nurse both contain the letter E, and can both be found in a hospital, you can use this shared letter as a reminder that stent refers to a certain type of medical device. Is it stent or stint? These words are pronounced differently by careful speakers, and should be used differently by careful writers. Stint is a noun; it means a span of time that someone spends doing a job or other activity. Stent, while also a noun, refers to a medical device used to clear or bypass blocked passageways. 1 What is the Difference Between Stint and Stent? Workout or Work Out –What’s the Difference?